Lafayette Physical Therapy provides cutting-edge innovation to promote your physical therapy and wellness goals. 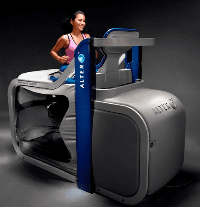 The AlterG® Anti-Gravity Treadmill® allows you to reduce gravity’s impact on your joints and muscles while improving mobility, strength and endurance. The AlterG® is compatible for athletes, seniors, youths, and those seeking to improve their health and wellness. The Anti-Gravity chamber allows you to safely move while training or rehabilitating. We are thrilled to offer independent wellness training with the AlterG® Anti-Gravity Treadmill® as well as include it as a part of our rehabilitation program in physical therapy. Please note that we provide a complimentary screening and informational session prior to independent use of the AlterG® Anti-Gravity Treadmill®. We offer individual session rates as well as packaged rates, please see our Rates section for further detail. 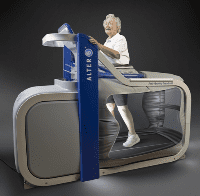 To learn more about the AlterG® Anti-Gravity Treadmill® by clicking here.